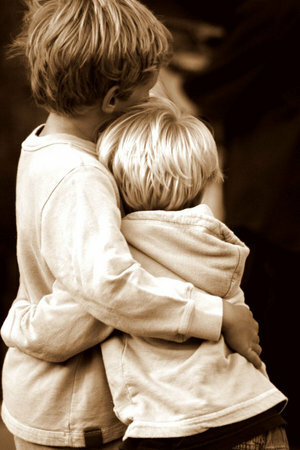 Of course, not all brothers love each other (or sisters either for that matter), but there is something indelible there. The Amplified translates this phrase: “loving [each other] as brethren [of one household].” The root of believers — operating as a family. Others have close family relationships and they have a different problem: they know the wonder of strong familial ties and often find a group of believers can rarely engender that kind of closeness or trust. I guess I’m somewhere in the middle, but probably leaning to the first example. My mother was mentally unstable and I never knew from one day to the next what I would awake to. My father died when I was child and I only had one sibling, five years my senior who left the family home for college and never returned in any kind of meaningful way. It was not until we were adults that we developed a truly mutual relationship. So, I confess, I’m not quick to embrace people with whom I am thrown together because we are affiliated with the same church body. It’s a trust issue, I know. I know. Here’s what should happen anyway (in theory . . . in my mind): believers are bound to one another by their faith in God. This is actually a blood bond because of the nature of the Christ. It does not flow through our veins, but through our Spirit selves. According to Peter, spiritually-based relationships should have harmony, sympathy (empathy), compassion, and humility. In general, this means deference to the other, concern for the other, sensitivity to the other, and willingness to compromise. Wait a minute. We could be doing this all the time, church or no church; family or no family; believer or no believer. These are the basics of “human.” These are the essential ingredients to relationships of all types: with strangers, lovers, or even casual acquaintances. Basics. Love of the first order. Love without strings. Love without labels. Good thoughts. I’m praying for more love for the Body of Christ I worship with right now. They are wonderful people. We are in a time, though, of understanding how to honor our leadership and the leadership is looking at how to serve us better and what is church discipline supposed to look like and when is it used. I think the key is “harmony, sympathy (empathy), compassion, and humility”.